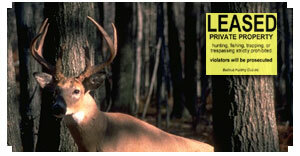 Over the past fifteen-twenty years, more and more private land has been converted to hunting leases. Leasing ones hunting lands has been the norm for many years in Texas. For many years hunting leases have also been relatively common in southern states such as Alabama, South Carolina, and Mississippi. Today leased lands are becoming common in big buck areas of the Midwest, and are moving into the east as well. There are pros and cons to this, but the data are clear, leasing is becoming an issue that hunters will have to deal with in the future. The reasons for leasing are varied, but from my discussions with farmers in several states, making ends meet on the family farm is difficult. Thus, some of those private landowners, many of whom formerly let some hunters on their property for nothing, are now leasing those hunting rights. Look at it from their perspective. Many farmers are aging, and finding it difficult to do the work and make ends meet. Others have already died and their sons and daughters now own the family farm, but don't live there. They either sell the farm, often to developers, or they try to keep it in the family. With no, or little, money coming into the farm to pay taxes, etc., they turn to hunting leases as a solution. Then there are the big corporate landowners. Take Mead-Westvaco Corporation in Ohio. They now lease much of their land there and one of the reasons they do this is financial. But there are other reasons for big corporations to lease lands. First, the persons leasing the hunting rights watch the property, helping to protect the timber, and the illegal use of off-road vehicles that destroy roads and increase erosion. Three years ago some of my friends and I leased around 450 acres of Mead-Westvaco land in Ohio. We're still having problems with 4-wheelers running over the property, but they are decreasing because we'll pursue arrests. Why did I decide to pay some money each year to lease? 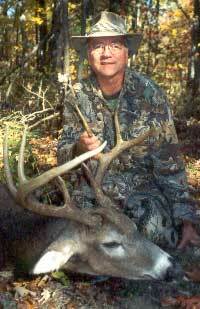 I wanted to have some property where I could be a part of controlling the quality of bucks. On our lease, we hammer the does, we let the little bucks walk, and no one steals our tree stands or invades our scouted areas. It is a quality hunt. And, because four of us have joined together, we're able to do some plantings, keep out trash dumpers, and split expenses four ways. Wildlife agencies fear leases for several reasons. First, leasing may mean that the average guy might be left out. This is a major concern. But they also fear that doe harvests will not be adequate on leased lands. This is a legitimate concern. On our lease in Ohio, we invite friends, mostly fathers and sons, to come on the property during gun doe season and help us harvest does. Even so, on many leased lands, getting adequate doe harvests is difficult.. But, consider that on un-leased private property, in many areas, getting adequate doe harvests is not happening. Who gets mad when a property is leased? Of course, the guys who hunted those private lands are upset. Most hunted there at no cost. It's understandable that they would be upset. But, from the landowners perspective, as land values increase (and land values increase in most places every year), as taxes go up (makes sense as land values increase, taxes go up), and the landowners income from his property stays the same, finances become a problem. If you hunted on someone's private land at no cost, then you got a free ride. Helping to cut hay, or mend fences, or cut firewood, might have been a way to give back to the landowner, but the realities are that few hunters do those things. Be that as it may, there is no question, the days of free hunting on private lands are coming to an end. Slowly but surely, many private farms and properties are being converted to leases. Does this leave the little guy out of hunting? To a degree it might. There is always public lands to hunt on. But, hunting seems better on private lands, which is why we all want our own little space to hunt. The solution? Get some friends together and find your own private land to lease. Start to plan to spend $200-$500 a year on this activity. Most hunters can afford to pay this amount, even if it means some sacrifices in other areas of ones budget. The trend is clear in whitetail country. Private lands are being leased, especially in the Midwest from Kansas to Ohio, Kentucky to Wisconsin. The better the buck potential, the more expensive the leases. Still, there are a lot of farms out there that are not leased where you can hunt, or where you and friends might obtain hunting rights. Be sure to visit Dr. Dave Samuel's Website - Dr. Dave Samuel is widely considered an authority on wildlife mgt. as well as the social and cultural influences of hunting. Dr. Dave spent 30 years as a wildlife professor and served as the conservation editor for Bowhunter Magazine since 1971. He is an author and much sought-after speaker in the topic of wildlife mgt. and hunting.